Where can I find my client’s eligibility letter? For applications that have EDE (Enhanced Direct Enrollment) features enabled, the eligibility letter will be available directly on your client dashboard. Click on the ‘Clients’ tab on the left-side of your dashboard. Search for the client’s name, and when found, click on their name. This will bring you to their application details page. Scroll down to the box that says ‘Application History’ and find the line with the correct Application ID Number listed. Under the column that reads ‘Eligibility’, there will be a ‘Download’ link. Click this link in order to download the eligibility letter. For applications that were not done through EDE, you can still access the eligibility letter through HealthCare.gov. Click ‘Access Marketplace’, located in the upper-right of your dashboard. 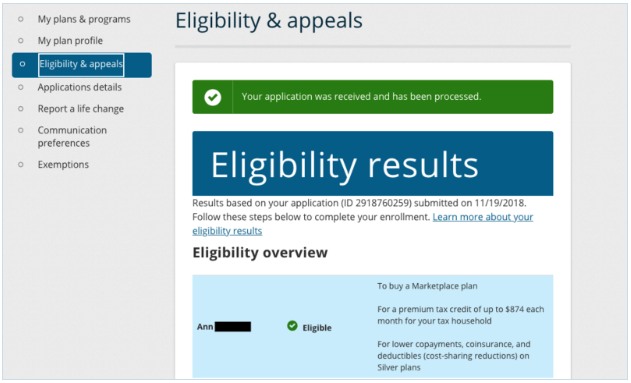 Choose the option on the right to search on HealthCare.gov using the client’s name, date of birth, state, and plan year. Click ‘Update’ to enter the application, and click ‘Eligibility and Appeals’ on the left-hand side. There will be a large button to ‘View Eligibility Notice (PDF)’.